Congress needlessly delays taking action on postal legislation. Private carriers compete with the governmental postal service while also being paid by the governmental postal service to transport mail. Loud voices declare that low postage rates are the best way to increase mail volumes. Critics call for privatization of the postal service. To many in the mailing industry, these appear to be the headlines from the last decade. However, as Devin Leonard points out in his enjoyable new book – Neither Snow Nor Rain: A History of the United States Postal Service – these arguments have been recycled for over two centuries. And if past is prologue, we can expect more of the same. The story of the establishment and growth of the U.S. Postal Service (“USPS”) is intertwined with the story of the establishment and growth of our country. As Leonard points out, the first attempts at a government-run post took place in the 1600s to aide communication between the colonies. There were varied levels of success, until 1753, when Benjamin Franklin received his royal appointment as deputy postmaster general of the colonies. Leonard explains how Franklin, along with his fellow deputy, William Hunter, instituted reforms that reverberate to today – the Dead Letter Office, postal inspectors and home delivery. After leaking private correspondence from the Massachusetts colonial governor about the Stamp Act, Franklin was removed from office. His loyalty to the cause was rewarded when the Second Continental Congress appointed him Postmaster General. 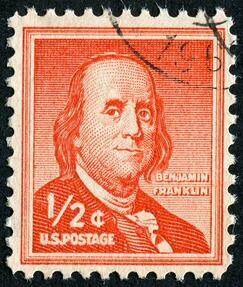 While Franklin may be the best known figure in postal history, he’s not alone. Leonard introduces his readers to a cast of colorful characters who influenced what Americans sent and how they used the mail as the nation grew. From William Harnden to Henry Wells to Anthony Comstock in the 19th century, and Albert Burleson to Jim Farley to James Radembacher in the 20th, people inside and outside the system shaped policies and progress. Entrepreneurs, union leaders, moral crusaders and postmasters general all played a role. Leonard dedicates almost 40% of the book to the last 50 years or so. This period covers the famous strike of 1970, reorganizing the Post Office Department into the United States Postal Service, the rise of FedEx and explosion of the internet. He was able to interview former and current postal leaders, and shares their insider look at the changes and challenges facing the USPS today. Like many of us who work in the industry, Leonard appears cautiously optimistic about the future of the USPS. Post offices are closing while package volumes are growing. The unions and management remain divided over how to best serve the country. And Congress – well, that would take another book. A good read that will have a special place on my bookcase.